The resorts and hotels on this page are on the beach-front on Pattaya Beach and beaches a little north and south of downtown (central) Pattaya. While the majority of these hotels and resorts do sit right on the beach-front and have direct beach access, some are separated from the beach by a minor footpath. When you click on the links the hotel page will open in Agoda.com. From there I recommend you take advantage of the genuine user reviews, hotel photos, hotel and room information, and use the map to view the exact location of the hotel. There’s just one hotel on the beach-front, with direct access to Pattaya Beach. There are though, lots of hotels on Pattaya Beach Road with magnificent views of the ocean and Pattaya Bay, and easy access to Pattaya Beach. 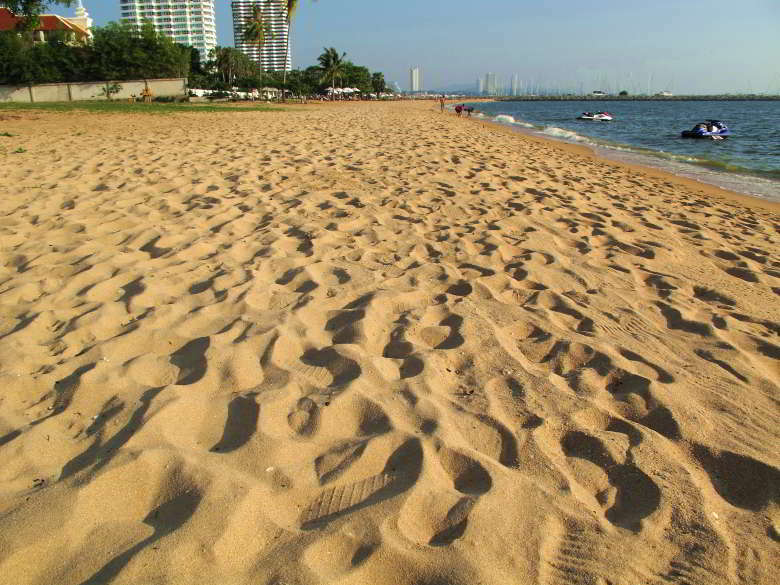 On the beach, Pattaya Beach and also overlooking Naklua Beach (family friendly). FEATURES: 24-hour room service, babysitting, coffee shop, concierge, poolside bar, fitness center, garden, kids club, steam-room, spa, tennis courts, free Wi-Fi in all rooms. So far as location goes, Dusit Thani is the only hotel on – and with direct access to Pattaya Beach, and it’s just a short walk down Soi 24 to the much more secluded Naklua Beach. If you want somewhere convenient yet secluded, right on the baht bus route, with a magnificent view of Pattaya Bay (great for the fireworks displays) this is it. Wongamat and Wongprachan beaches just a few minutes drive north of Central Pattaya, these are both quiet locations, making them a good choice for families. Wongamat Beach, north of Pattaya. FEATURES: 24-hour room service, concierge, bar, fitness center, garden, children’s pool, spa. On the beach (family friendly). FEATURES: 24-hour room service, concierge, poolside bar, fitness center, garden, kids club, children’s pool, spa, tennis courts, water sports, water amusement park. On the beach – family friendly. FEATURES: Private beach, 2 swimming pools, 7 beach restaurants, bars & karaoke, Luminous Spa, Fitness room, Kids play room, 24 hour room service, Baby sitting, Children’s menu, Children’s activities, Free Wi-Fi, Bicycle rental. On the beach (Wongprachan, north of Wongamat Beach) (family friendly). FEATURES: 24-hour room service, ATM/cash machine on site, babysitting, coffee shop, concierge, poolside bar, fitness center, garden, kids club, children’s pool, spa. FEATURES: 24-hour room service, coffee shop, poolside bar, garden, children’s pool, solarium. FEATURES: 24-hour room service, babysitting, bicycle rental, coffee shop, concierge, facilities for disabled guests, family rooms, poolside bar, fitness center, games room, garden, kids club, children’s pool, steam-room, table tennis, water sports, free Wi-Fi in all rooms. FEATURES: 24-hour room service, coffee shop, poolside bar, fitness center, garden, children’s pool, steam-room, spa. Man made beach elevated above what is otherwise a rocky beach. Family friendly. FEATURES: 24-hour room service, ATM/cash machine on site, babysitting, BBQ facilities, coffee shop, concierge, facilities for disabled guests, family rooms, fitness center, garden, children’s pool, Wi-Fi in public areas. Hotel description snippets: Complimentary shuttle van service to downtown Pattaya 6 times daily with free Wi-fi on van, making it easier for you to explore the city. Three free-form swimming pools are surrounded by tropical gardens and offer the perfect setting for a refreshing swim. Krating Lai Beach is situated in North Pattaya, north of Wongamat and Naklua beaches, you can use the white baht buses, a local taxi service or the hotels shuttle services to commute to Pattaya. Krating Lai Beach is a picturesque beach, great for a stroll or to relax on a lounger, but not really suitable for bathing. Although the sand is golden and fine, the seabed is rather muddy. Nearest attraction to Kratinglai Beach is Mini Siam. There are 2 restaurants on the beach, one is just north of Cholchan Resort, the other is on the beach in front Bella Villa Cabana. 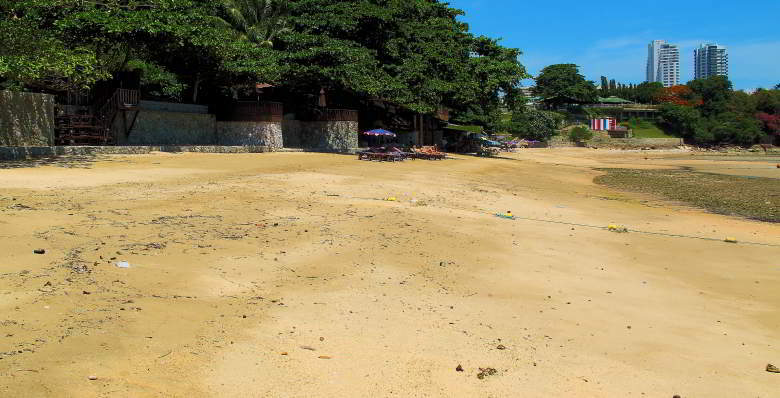 Krating Lai Beach, north of Naklua and Pattaya. 20 meters from the beach, across a pedestrian walkway. Rather muddy beyond the waterline so not ideal for bathing, but there is a fantastic beach restaurant directly in front of the hotel. Family friendly. FEATURES: concierge, family rooms, poolside bar, fitness center, garden, children’s pool, steam-room, free Wi-Fi in all rooms. Hotel description snippets: Guest room appointments consist of cable television, data port, balcony deck, coffee/tea maker, and in-room safe. For guests convenience, this wonderful Pattaya hotel offers multi-lingual staff, car rentals, laundry service, 24-hour room service, and safety deposit box. On the beach, rather muddy beyond the waterline, not ideal for bathing, but still a very beautiful beach which has nice features, including exercise areas, also 2 delightful restaurants right on the beach. FEATURES: 24-hour room service, coffee shop, concierge, facilities for disabled guests, family rooms, children s playground, poolside bar, fitness center, garden, kids club, children’s pool, squash courts, table tennis, tennis courts. Hotel description snippets: For those who choose to venture to the city, a shuttle service is available. 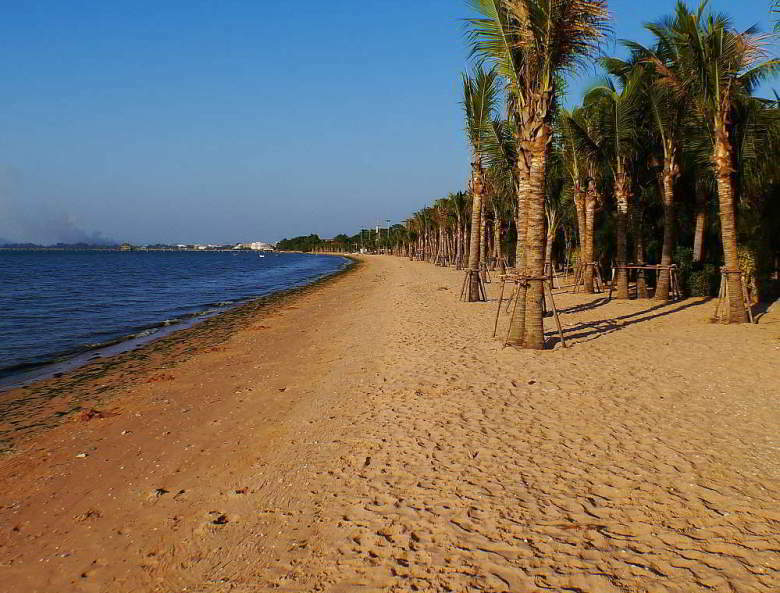 Dongtan Beach sits between Jomtien Beach and Pratumnak Beach, the resorts here are separated from the beach by a paved pedestrian footpath. Baht buses from Jomtien Beach Road are the most convenient way to commute to Pattaya. Closest attraction is Pattaya Water Park, just a couple of minutes walk up the footpath. Dongtan Beach, between Pattaya and Jomtien. 20 meters from beach, cross a pedestrian footpath. FEATURES: coffee shop, concierge, garden, children’s pool, Wi-Fi in public areas. 10 meters from beach, cross a pedestrian footpath. FEATURES: 24-hour room service, coffee shop, concierge, facilities for disabled guests, poolside bar, fitness center, garden, children’s pool, free Wi-Fi in all rooms. 10 meters from beach, cross a pedestrian footpath. Family friendly. FEATURES: babysitting, pets allowed, garden, children’s pool, free Wi-Fi in all rooms. Hotel description snippets: The 49 Thai Beach Villas feature one and two stories and boasts Thai ambiance using reclaimed wood and lush tropical gardens set within a beautiful forest. The resort is all about nature, sweet singing birds, and excellent service with personal attention. This a beautiful secluded beach, nestling at the bottom of a steep hillside. Used almost exclusively by guests of the Asia hotel and the Birds and Bees Resort. Asia Hotel Beach, between Pattaya and Jomtien. On the beach, steps and pathway through the resort lead directly to the beach. Family friendly. FEATURES: children’s pool, family rooms, garden, Wi-Fi in public areas, coffee shop. Na Jomtien Beach is situated south of Jomtien Beach and extends as far as Bang Saray, this is a long beach and therefore this is where most of Pattaya’s beach resorts and hotels can be found. Most the hotels and resorts have restaurants on the beach, there are plenty of small bars and eating places on this beach, including The View and The Glasshouse restaurants. Nearby attractions include Pattaya Floating Market, Jomtien Elephant Village, Alangkarn Theater and Mimosa. Most hotels offer a shuttle service to Pattaya, but baht buses (songthaews) pass every few minutes on the highway, for 10-20 baht they will drop you at the south, central, or north Pattaya junctions. Na Jomtien Beach, south of Pattaya. FEATURES: 24-hour room service, Babysitting, Bar, Concierge, Disabled facilities, Family rooms, Laundry service, Poolside bar, Restaurant, Shuttle service, Wheelchair access, Fitness center, Garden, Kids club, Massage, Swimming pool, Kids pool, Private beach, Sauna, Free Wi-Fi in room, Wi-Fi in public areas. FEATURES: 24-hour room service, Babysitting, Bar, Concierge, Disabled facilities, Family Rooms, Laundry service, Poolside bar, Restaurant, Shuttle service, Wheelchair access, Children’s playground, Fitness center, Games room, Garden, Kids club, Massage, Swimming pool, Kids pool, Private beach, Sauna, Tennis courts, Free Wi-Fi in room. 40 meters from the beach, (minimum age of guests is 6 years). FEATURES: fitness center, free Wi-Fi in all rooms, karaoke, garden, children’s pool, solarium. FEATURES: poolside bar, fitness center, children’s pool. FEATURES: 24-hour room service, babysitting, coffee shop, concierge, poolside bar, fitness center, garden, on site golf course, children’s pool, spa, free Wi-Fi in all rooms. FEATURES: 24-hour room service, babysitting, coffee shop, facilities for disabled guests, family rooms, fitness center, garden, children’s pool, tennis courts, free Wi-Fi in all rooms. Recreational facilities and amenities available include a swimming pool with a children’s paddle pool, tennis courts, a large lawn with palm trees and sunshades, traditional Thai massages, table tennis, snooker tables, darts, boccia/petanque, badminton, regular folklore and Thai dance evenings, water sports on the beach, and much more. FEATURES: 24-hour room service, babysitting, coffee shop, concierge, facilities for disabled guests, family rooms, poolside bar, fitness center, garden, children’s playground, kids club, children’s pool, spa. FEATURES: bar, nightclub, restaurant, room service, private beach, free Wi-Fi in rooms, Wi-Fi in public areas. FEATURES: babysitting, coffee shop, concierge, family rooms, nightclub, poolside bar, fitness center, garden, children’s pool, spa, sauna, squash courts, tennis courts, Wi-Fi in public areas. FEATURES: babysitting, bicycle rental, coffee shop, concierge, family rooms, poolside bar, children’s playground, fitness center, garden, children’s pool, steam-room, spa, tennis courts, free Wi-Fi in all rooms. On the beach – family friendly – pet friendly. FEATURES: babysitting, bicycle rental, pets allowed, garden, children s pool, sauna, tennis courts, water sports, free Wi-Fi in all rooms. FEATURES: coffee shop, concierge, poolside bar, fitness center, garden, children’s pool, Wi-Fi in public areas. Search for the lowest rates: Enter your hotel name into HotelsCombined.com and search for the lowest available current rates on all the top hotel booking sites.